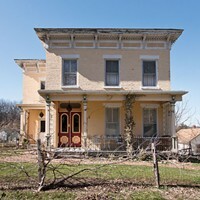 Raised in Red Hook but a Williamsburg pioneer since 1981—when punk rockers ruled the neighborhood—artist Paula Kucera never imagined she’d be raising 19 sheep along with two Waldorf-educated children, and long-married to David Kucera, who owns a specialty concrete business in Gardiner. But what’s truly ironic is that the family’s second attempt at building a “dream house”— this time, a zero-net-energy dwelling constructed around the skeleton of a repurposed 1850’s barn frame—effortlessly casts their activities and belongings in a way that’s actually more organically architectural than the wholly contemporary first one. The Kuceras’ debut dream home, a picturesque cube they designed, built, and ultimately sold to Hudson Valley weekenders, fortunately proved a great investment. Its timely sale also helped fund the simpler, back-to-the-land way the funky family of four lives today. 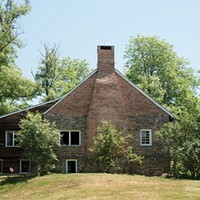 In 1996, the newlyweds, who met in a Brooklyn bar, stretched financially to purchase a 72-acre farm bordering Albany Post Road in New Paltz that featured a stately white barn, grain silo and other vintage outbuildings. Soon they began designing, and actually building themselves, an extremely modern showplace at an elevated point on the property. Hard-working green design sophisticates who appeared to spare no materials expense, the Kuceras’ Dream Home One in increasingly trendy greater New Paltz wouldn’t look out of place on “Goldman Pond” in the Hamptons. Ultimately, it wasn’t quite right in several key ways for the Kuceras—who both had businesses to build—as a full-time residence for their family’s active outdoorsy lifestyle. “In many ways, it was our dream house, but if the kids threw a jacket on the back of a chair, the whole line of the room would look messed up,” said Paula. So they sold it. Plus half their land. At a decent profit, about six years ago, before the real-estate market tanked. To people from New York for whom it’s a fantasy “Green Acres” getaway. The Kuceras can still gaze at Dream Home One and admire its boxy, glassy beauty. That’s even better than living inside it anyway, according to Paula. David found it harder to part with. “I think David now agrees with me, but what happened was we were just taxed out. We’d made this thing worth a phenomenal amount of money and the taxes we paid were not in line with the money we made, so we sold it, downsized, and kept half the land,” she explained. Paula now has a yarn business, but she used to trot the globe as a decorative artist, sometimes painting restaurant murals. David grew up outside Philadelphia and makes architectural cast concrete. He’s done massive restoration projects for the Brooklyn Academy of Music and The Metropolitan Museum of Art’s Greek and Roman Room. Unwinding from the status plateau of Dream Home One—with a full nest and growing reputation for great aesthetic taste—could have proved depressingly downwardly mobile to a less creative couple. But the Kuceras once again danced with sure-footed style straight into another hot trend: right-sized, reclaimed timber-frame construction, filled in with structural insulated panels. Windows are cut after the walls go up, providing an incredibly tight seal against the elements. Paula found an 1850s barn frame for $18,000 from Benedict Barns in Pennsylvania. David figured out the engineering logistics. Together, with only the occasional hired specialist like a plumber or electrician, the couple built another home. This time, the Kucera residence is much simplified at just 2,000 square feet, not counting the basement. 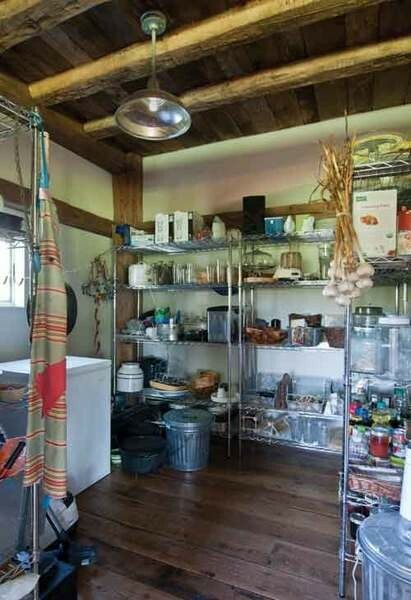 It has relatively huge mud and laundry rooms. Seasonal fluctuations in wind, temperature, and light are maximized desirably by a deep deck and tiny windows on the north side, and lots of glass—shaded by deciduous trees—on the sunny south face. A behemoth two-sided stone fireplace, which throws off maximum heat via a shape that’s tall and shallow, separates the living room from the den. Off the kitchen, there’s a pair of love seats covered in a sturdy bright floral from Gardiner-based Utility Canvas Inc., owned by Paula’s friends Hal Grano and Jillian Kaufman-Grano. Ornate tin sconces found on a vacation to Utah, probably antiques from Mexico, break up the bluestone chimney expanse. The Kuceras plunged financially into sustainable energy at a time when the state was giving generous homeowner credits. They invested in state-of-the-art solar panels and a geothermal heat pump, probably cash-positive in two years, ahead of initial projections. “Here’s how I found the money for the [sustainable energy systems.] I decided I’d just buy off-the-shelf tile and plumbing fixtures and everything else from places like Lowe’s,” said Paula, who doesn’t regret the compromise. David made the counterttops at his factory, adding locally sourced conglomerate to concrete and then polishing the slabs. Attractively distressed planks from their first marital bed were reused for the kitchen drawer fronts. “I love nests,” said Paula, showing me a collection on display in the den’s family “nature table,” which corners an oversize velveteen couch upholstered in a muted robin’s-egg blue. A row of elegant ceramic vessels in complementary brown tinged with teal, thrown by Armand Rusillon, a well-known Hudson Valley artist who sometimes makes pots, lines the den mantle. Son Cameron, 15, is away at Wild Earth Wilderness School, a Shawangunk camp where he’s a counselor-in-training. Paula picks another treasure off the table—presided over by a taxidermy woodpecker Cameron helped stuff—to show me. “Cameron’s great at making knives. And see these arrowheads? The kids flint-napped them,” said Paula. 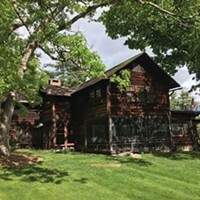 Both Cameron and daughter Lia, 12, attended Mountain Laurel Waldorf School in New Paltz, a prestigious early-childhood learning institution based on principals suggested by movement founder Rudolf Steiner. Cameron and Lia both began knitting in first grade at Mountain Laurel. The craft allegedly facilitates conversation between the right brain and left brain of a developing child. Ever the involved mother, Paula made textile art with her kids and augmented other parts of their heavily experiential education. She began growing much of the family’s food from seeds, then raising chickens, and finally keeping Cormo sheep, which grow a fine wool much like merino. They’re also small and agile, like Paula. She bought a spinning wheel and planted a dye garden. Last September, Paula opened White Barn Farm Sheep and Wool, which sells hand-dyed yarn and hosts knitting, felting, and spinning workshops. It’s where art meets agriculture, she says, adding that she sells fiber from other growers as well as her own. “I knew our barn had another life in it,” said Paula. True Value of New Paltz Inc.
Hardware store owner Louis Benson provided the Kuceras with much advice and personal assistance. Most of the downstairs interior is painted with Benjamin Moore’s Natura no-VOC November Rain. Antiques Barn at the Water Street Market, New Paltz. While David made the countertops for his own home, his company principally provides architectural cast stone and glass-fiber reinforced concrete products to businesses and institutions. Provided slabs of conglomerate and smaller pieces of bluestone for the fireplace. Vice-president John Wright supervised the project. installing solar panels for electricity and a geothermal heat pump for heating and cooling. Owners Hal Grano & Jillian Kaufman-Grano founded the canvas-specialty company in 1990; it now has retail locations in Manhattan and Tokyo. Utility Canvas primarily sells bags and clothing. 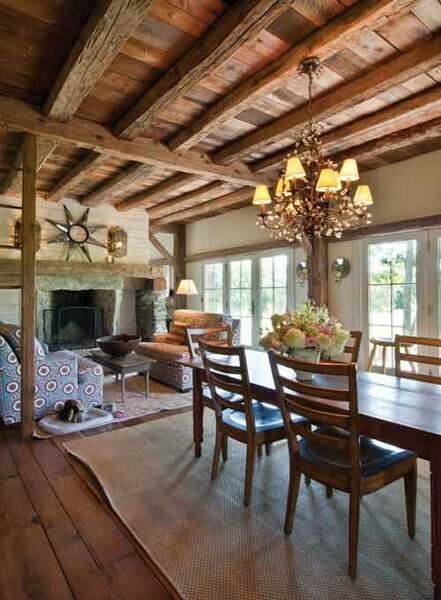 Provided the 19th-century barn frame, antique hand-hewn beams, floor planks, and structural insulated panels for the Kuceras’ timber-frame house. The dining room/living room with a two-sided fireplace. Lia Kucera prepares a snack in the kitchen. 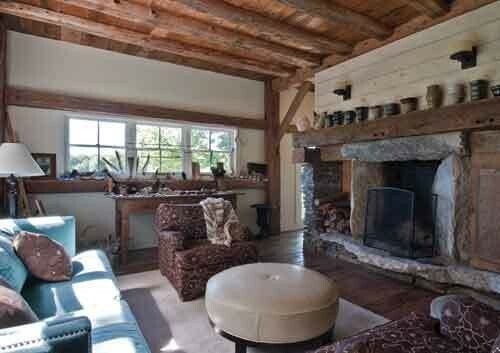 The family room where pottery by friends and family members lines the mantel. Paula Kucera, of White Barn Sheep and Wool, with her Cormo sheep outside her Gardiner home.